Rebecca Skloot reads from The Immortal Life of Henrietta Lacks tonight. Henrietta Lacks was a poor Southern tobacco farmer whose cells (dubbed HeLa cells) were taken without her knowledge and were of vital use in developing the polio vaccine, in cancer research and in gene mapping, among other things. Her cells helped launch a multimillion-dollar industry that sells human biological materials, yet her family never saw any of the profits. Seed magazine says "The history of HeLa is a rare and powerful combination of race, class, gender, medicine, bioethics, and intellectual property; far more rare is the writer that can so clearly fuse those disparate threads into a personal story so rich and compelling. Rebecca Skloot has crafted a unique piece of science journalism that is impossible to put down - or to forget." Harold Washington Library, 400 S. State, 6pm. The Chicago Public Library presents the first in a series of hosted happy hours. Guests can expect to learn more about free offerings from the CPL, as well as get a library card and mingle with fellow CPL patrons while enjoying a two-hour hosted bar. More information about this event and other CPL programming can be found at http://notwhatyouthink.tumblr.com. The first 100 guests to RSVP to notwhatyouthink@allterrain.net will receive a free t-shirt (and it's really nice). This event is for guests 21 and over in age. 6pm - 9pm. Villain's Bar & Grill, 649 S. Clark Street. Mahoney's Pub & Grille, 551 N. Ogden Ave., hosts Laugh for the Cure, a comedy show benefiting the Leukemia and Lymphoma Society, from 7pm to 10pm tonight. Dobie Maxwell, Brian Hicks, Cameron Esposito and Elly Greenspahn perform. Tickets are $20-$35, available online, by calling 312-733-2121 or at the door. Bomb & Bird is the latest reading series taking place tonight at Innertown Pub (1935 West Thomas St), starting at 7:30pm. Bring poetry, prose, what have you (the brave souls even say they'll accept your worst work as well as your best). The event is free, and you get five minutes of open-mic floor time -- first come, first-served. Today marks the first day of Chicago Craft Beer Week, a citywide event of samplings, parties, lectures and demonstrations of the Devil's Water. Series runs through May 27. 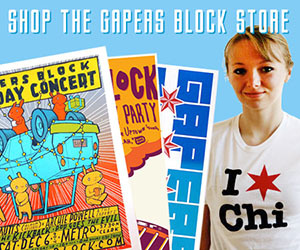 Join the Art Institute of Chicago, Explore Chicago and Gapers Block for a special get together celebrating the exhibition Hyperlinks: Architecture and Design in the Modern Wing of the museum (159 E. Monroe) from 5pm to 8pm. Meet us at the Modern Wing's Caffè Moderno -- look for buttons and nametags -- for drinks and mingling. Then at 6:45, we'll get a special tour of the Hyperlinks exhibit in Galleries A+D. Best of all, admission is free! Please RSVP on Facebook so we and the Art Institute can get a feel for how many people to expect. 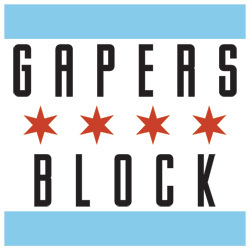 Our own Anne Holub, editor of the Transmission section here at Gapers Block, will be participating in a DePaul University event, Staying In Tune: Covering Chicago's Music Scene. She'll be joined by fellow panelists Jaime Black founder of ChicagoVerseUnited and Dynasty Podcasts; Neptali Figueroa, president of RWIM - Chicago; Miles Raymer, music writer for the Reader; and Amy Phillips, news editor for Pitchfork. Loud Loop Press founder/editor-in-chief Richard Giraldi will be moderating the panel discussion. This is free event. 247 S. State Street at 7pm. For more information visit the event's sponsor SPJ DePaul's website or download this flyer.